What a pretty place. Lovely white lights zig-zagging across the ceiling framed the main room beautifully. There were several wooden tables strategically placed around the room to provide the maximum in comfort and ambiance. Real flowers in glass vases were atop each table, as was a white paper tablecloth. 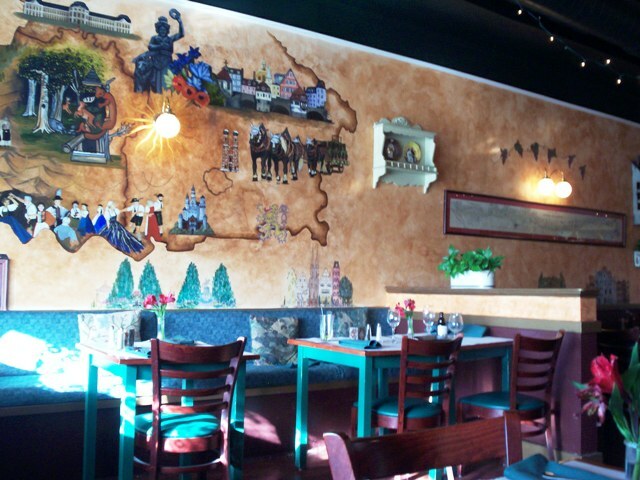 With lovely murals all over the walls, it was a warm and inviting interior. We were immediately approached by a friendly waitress named Jennifer. She proved to be very cheery, knowledgeable and efficient throughout our visit. She asked us if we'd like to be seated by the windows, and we did. We were able to look out at the park across the street, and the water beyond that. Jennifer brought us menus and took our drink order - two Diet Cokes. We had the lunch menu, but I had also read the dinner menu online, and both were interesting and eclectic. They carry dishes for every appetite, whether you feel like having steak, chicken, seafood or German specialties, but with an upscale twist. 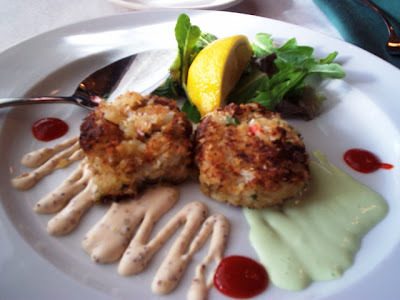 They also have some unusual appetizers (littlenecks and chourico, Jonah crabcakes, asparagus pfannkuchen, etc.) along with soups and salads. You can also get a burger or a pasta dish or some sandwiches/wraps. 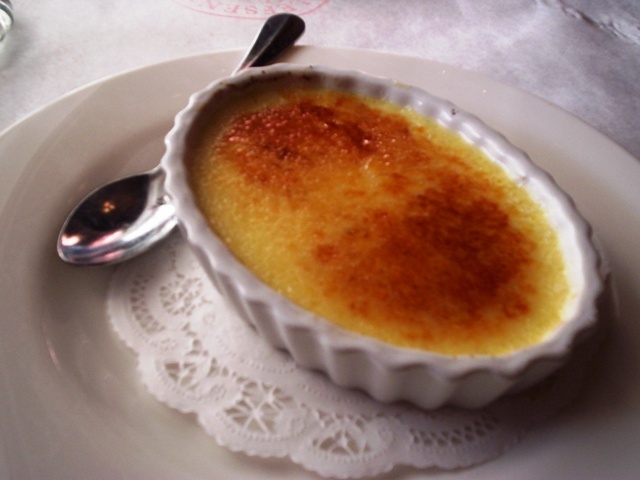 Finally, you can end your meal with a fantastic dessert (apple strudel, creme brulee, crepe, mousse cake, and more). We had a tough time deciding what we wanted. Laura decided to try The Ultimate Grilled Cheese, which was goat cheese and fig puree on grilled sourdough bread. 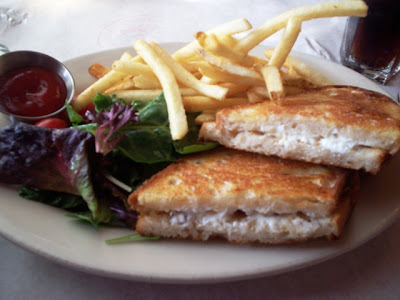 It was served with fries and a side salad. She absolutely loved this sandwich. She found that the sweetness of the fig and the saltiness of the cheese combined to make a sandwich that tasted like a sweetened cream cheese. The bread was buttery and toasty and held the filling very well. Her fries were terrific and the salad tasty. She was more than pleased with this meal. 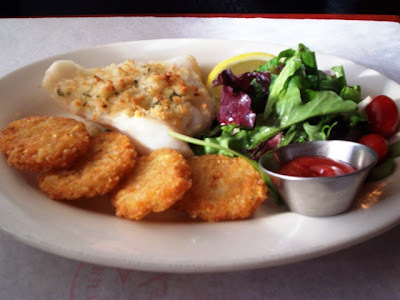 I decided on the baked cod, which turned out to be a nice-sized piece of perfectly prepared cod fish topped with crispy Panko breadcrumbs. It was accompanied by crispy potato cakes and a side salad. Great choice. Everything was delicious. The fish was flaky, moist and fall-apart tender. The potato cakes were like tater tots that had been flattened into patties and fried crisp - yummy. The side salad was fine. This was a great lunch. Several times during our meal Jennifer checked on how we were doing. We were doing just fine, and she was great. As she cleared away our empty plates, we asked to see the dessert menu. We usually don't do dessert, but everything had been so good we decided to indulge. Laura got the Grand Marnier creme brulee which came in a shallow oval platter. After she broke through the crystallized topping (don't you love that?) she rolled her eyes in ecstasy. It was so creamy and delicious and you could really taste the Grand Marnier. She let me taste a spoonful and I concured; it was terrific. 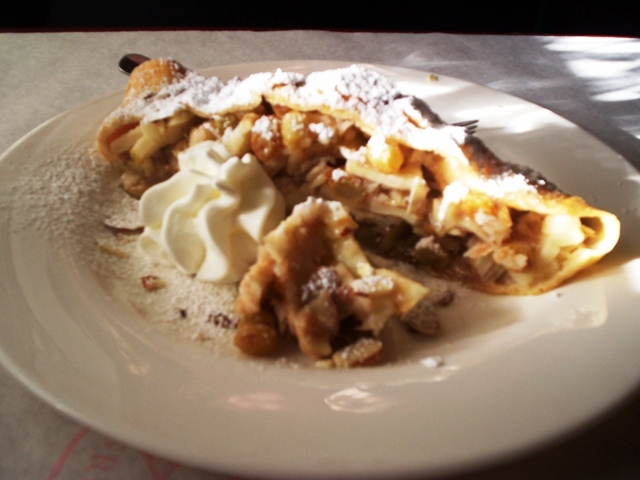 I chose the the warm apple strudel, which was a large slice of strudel filled with apples and golden raisins and topped with slivered almonds with whipped cream on the side. To say it was delicious is an understatement. I'd get this again in a minute. I let Laura taste it and she felt the same. To say we had an excellent lunch is also an understatement. We will be back Redlefsen's, sooner than later. 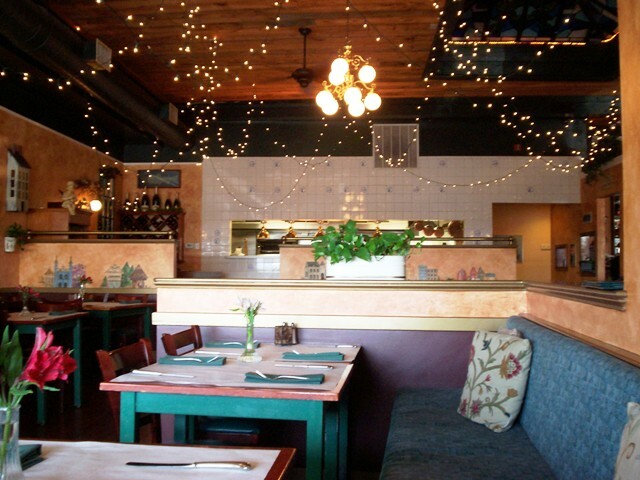 Ambiance, service and food couldn't have been improved upon. Even the restroom (which we always check out) was clean and attractive. 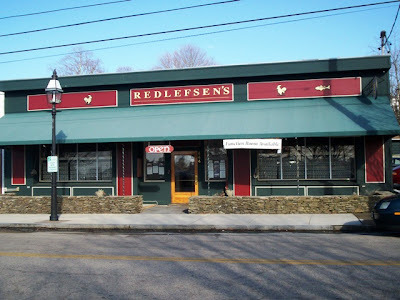 THE VERDICT: Run, don't walk, to Redlefsen's for a wonderful dining experience. We paid $66 with a 20% tip for Jennifer, however, thanks to our $10 gift certificate, we really only paid $56. 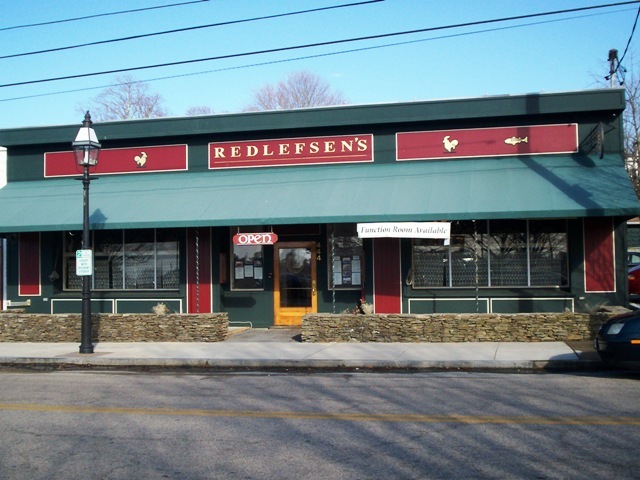 Redlefsen's Rotisserie and Grill is open from 11:30 a.m. to 9 p.m. Monday through Thursday, 11:30 a.m. to 10 p.m. Friday and Saturday, and 11:30 a.m. to 8 p.m. Sunday. Don't forget to check out MenuJoy.com for great area restaurant menus and to win gift certificates of your own!